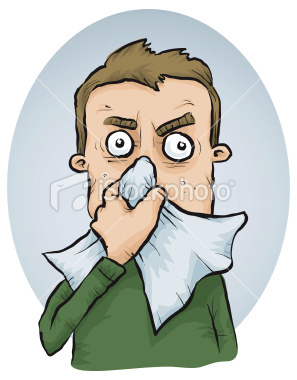 Jonathan Crocker » Blog Archive » What Happens When… I Get Hayfever? Navigation: Weblog / Blog article: What Happens When… I Get Hayfever? Oh, happy day! Spring has sprung, summer is brewing and you can start enjoying the great outdoors again. But also, if you’re among the unlucky 20% of allergic UK men, another brutal attack of hayfever. “In March and April, pollen grains from trees start to absorb moisture, then swell and burst, showering tiny pollen granules into the atmosphere,” says Dr Adrian Morris, a Harley Street allergy specialist. “These then head into your eyes, up your nose and from there, down into your lungs.” Global warming is boosting pollen counts, so check the forecast to see if you’re in the danger zone. And if someone offers you shares in a hanky company, take ’em. As you stroll or jog past trees (shortcut to the pub?) and breathe in the pollen, your body cranks up a gooey inflammatory riposte. Yes, snot. “Hayfever begins when the body makes allergic antibodies to pollens,” says John Collard, allergy consultant at Allergy UK. “The reaction between the pollen and the antibodies releases histamine from cells in your nose and eyes.” This then triggers mucus production and your nose running like a French soldier. Smart move: eat a daily teaspoonful of honey, which is contaminated with pollen grains and will help vaccinate you against its sniffly effects. Smarter move: get your mates to come round with the beer. As you’re sneezing like a howitzer, the pollen that’s landed in your eyes is wreaking its own histamine havoc. “It irritates nerve cells in your eyes and dilutes their blood vessels, causing your eyes to go raw and itchy,” says Dr Morris. “A dose of antihistamines are very effective for combatting this early allergic reaction,” says Dr Morris. Ask your pharmacist for Zirtek (£7.99). Studies by Allergy and Immunology division of Kingston General Hospital, Kingston in Ontario in the US found it was one of the fastest acting and longest lasting antihistamines. Much easier to pronounce chlorphenamine and fexofenadine, too. Congrats. You’re past the first wave of hayfever horror. But from May to July, a second front opens, courtesy of <grass> pollen. “Whether you suffer from tree or grass hayfever, the mechanism is the same,” says Collard. “Some people have mainly eye symptoms while for others it’s the nose or both – we don’t know why.” You can desensitise yourself to grass pollen by taking Grazax tablets, which help 50% of men with severe allergies to grass pollen. But at £70 per month, they’re going to seriously dent your holiday fund. If you haven’t managed to nip hayfever’s early effects in the bud by mid-Summer, things can now get brutal. An unhindered allergic reaction now triggers another volley of inflammatory chemicals in your body. “This is leucotriene,” says Collard. “And it can cause cause inflammation which produces congestion in your nasal passages. This can even cause breathing difficulties as your airways become sore and swollen.” Ask your GP to prescribe a steroid spray like Syntaris, which shrinks your nasal blood vessels and therefore decreases inflammation – plus try popping Otrivine Antistin Eye Drops (£4.99, boots.com) to take care of the other half of the equation. Most crucially, take a few days off work. You look terrible. And that Family Guy boxset isn’t going to watch itself.